I think I've solved the mystery of the other hot water problem. A lovely reader pointed out to me that I had neglected to account for the flow of water through pipes-- specifically the idea that pipes have a threshold for how much water can flow through them at any given moment (at least, for our purposes they do). This is the missing piece to the puzzle! If I turn up my water pressure higher than the maximum rate at which hot water can flow through the pipe from my heater to the shower, the plumbing is going to add more cold water to the flow to make up the difference. This is assuming that the maximum flow of cold water is higher than the maximum flow of hot water, which is a pretty safe assumption since cold water is essentially an unlimited resource here. Conclusion: If I drop the shower pressure to be at or below the maximum hot water pipe capacity, I can have as much hot water as I want. Not nerdy enough for you? Fear not, I also graphed it. 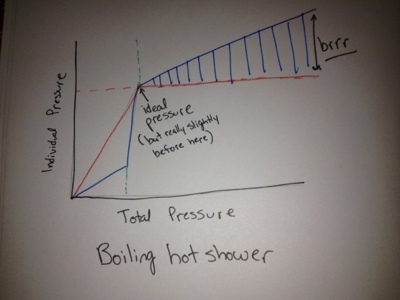 The top graph illustrates the theoretical ideal water pressure for a lukewarm shower (equal parts hot and cold water). The bottom one illustrates the theoretical ideal water pressure for a VERY hot shower (much more hot water than cold water).